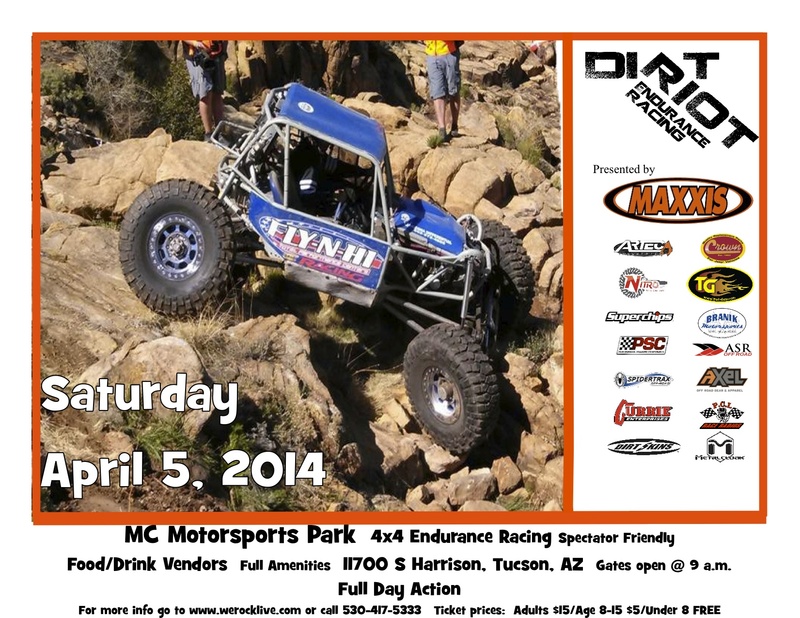 BLACKFOOT, ID APRIL 1, 2014: The Dirt Riot Southwest Series will lay tracks in the Tucson Arizona desert this Saturday April 5th at the MC Motorsports Park. LetzRoll Offroad Andrew McLaughlin, the winner of the first event, will be racing to maintain his series lead over Mesa’s Airen Patrick and Fly-N-Hi Performance Center’s Jeremy Hammer. 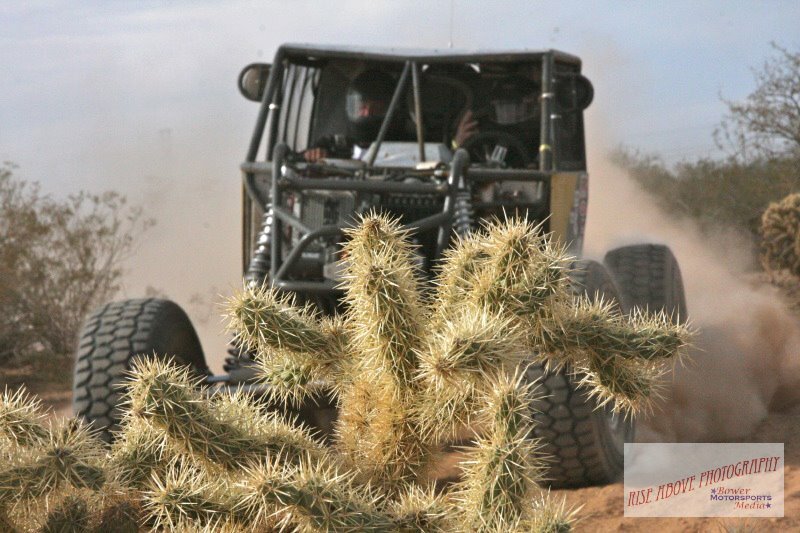 Meet the drivers Friday night at 4 Wheel Parts in Tucson and then watch the action trackside on Saturday. 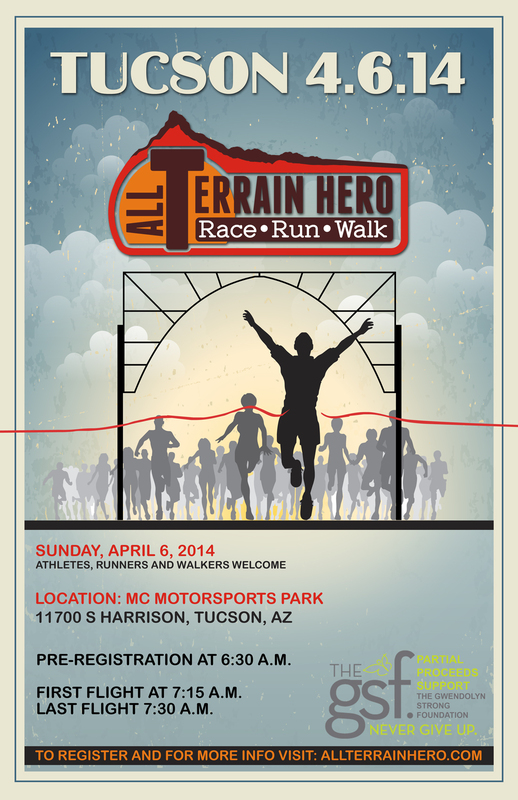 Sunday W.E.Rock Events will host the first ever All-Terrain Hero Race * Run * Walk. Local UTV and 4×4 Sportsman drivers are encouraged to join in on the racing fun. With only some simple safety requirements, anyone is able to come and race! The list of pre-registered drivers includes Pro Class 4400 LetzRoll Offroad Racing Andrew McLaughlin, 602 Airen Patrick, Fly-N-Hi Racing Jeremy Hammer, Goodall Racing Ken Goodall and Rocking J Offroad John Brock. Pro Class 4500 LetzRoll Offroad Racing Alan Johnson and Muddnutt Racing Kevin Rants along with Pro Class 4600 drivers F&F Racing Cody Folsom, LetzRoll Offroad Racing Matt Salyers and Four Corners 4×4 Jason Kaminsky. There are four drivers pre-registered in the Unlimited Trail Class: Short Bus Mafia Racing Carlos Gonzales, Select Glass/Jones Auto Center Racing Jayson Mitchell, Rolling Gnomes Paul Tyler, and JSE Racing Joe Whitcomb, and in the Modified Trail Class, Scrap Metal Racing John Garrison and Goodall Racing Shannon Goodall will take the track again. Pre-registered in the UTV class includes Trevor Crane, Colecar Motorsports Colby Johnsen and Undertakers Racing Frank Minice. Spectators are encouraged to come and enjoy the day of entertainment on Saturday April 5th. Admission is $15 for adults, $5 for ages 8-15, children 7 and under free and Military with ID get $5 off. There are vendors, food and amenities on site, and we encourage you to bring chairs and shade structures. http://www.werocklive.com/events/dirt-riot-southwest-round-2-2/. There are three Professional 4×4 classes, a Trail/Sportsman 4×4 class and a UTV class. The classes are built to encourage local 4×4 or UTV participants to join us in a day of fun racing. For fees and payout information go to http://www.werocklive.com/2014-fees-payout/. Dirt Riot is an Endurance Racing series that is composed of five series of three races that stretch across the country.